Marvel is taking comics to the edge of the galaxy in a new miniseries that ties in to the Star Wars theme parks that Disney is opening this year. Star Wars: Galaxy’s Edge is written by Ethan Sacks (Old Man Hawkeye) and drawn by Will Sliney (Star Wars: Beckett #1). The first of five issues, which is covered by Rod Reis, will be on sale in April. 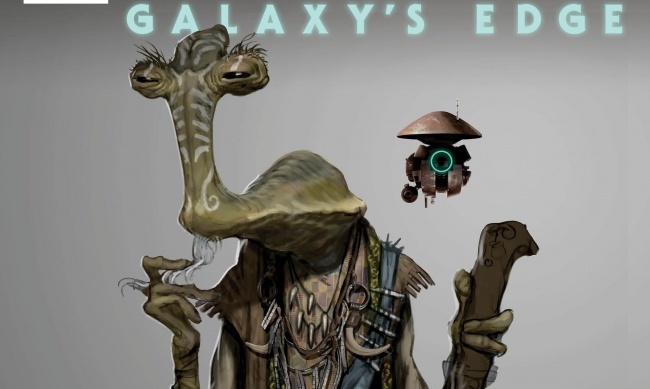 Star Wars: Galaxy’s Edge is set at Black Spire Outpost, a lawless outpost on the edge of known space and the center of the galaxy’s black market. 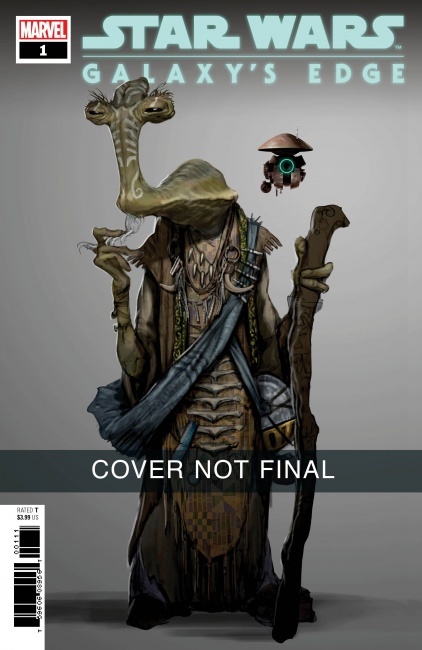 The First Order threatens the livelihoods of the various merchants, smugglers, and travellers who make their way to Batuu in the Outer Rim, including Ithorian antiquities collector Dok-Ondar. Star Wars remains a lucrative merchandising behemoth, with a series of True Believers planned for May the 4th (see “Preview: May The 4th 'Star Wars: True Believers'”), the Age of Rebellion one-shots launching in April (see “'Star Wars' Enters the 'Age of Rebellion'”), a role-playing sourcebook planned for Q2 (see “Official RPG Stats For 130 (In)Famous NPCs in the 'Star Wars' Universe”), multiple series for Disney+ (see “'Mandalorian' Casting” and "Disney’s OTT Service Name, ‘Rogue One’ Series"), and much more coming to market. The final film in the third trilogy is due in theaters on December 20 (see “From Tardis to Tie Fighter - Matt Smith Executes Quantum Shift”).